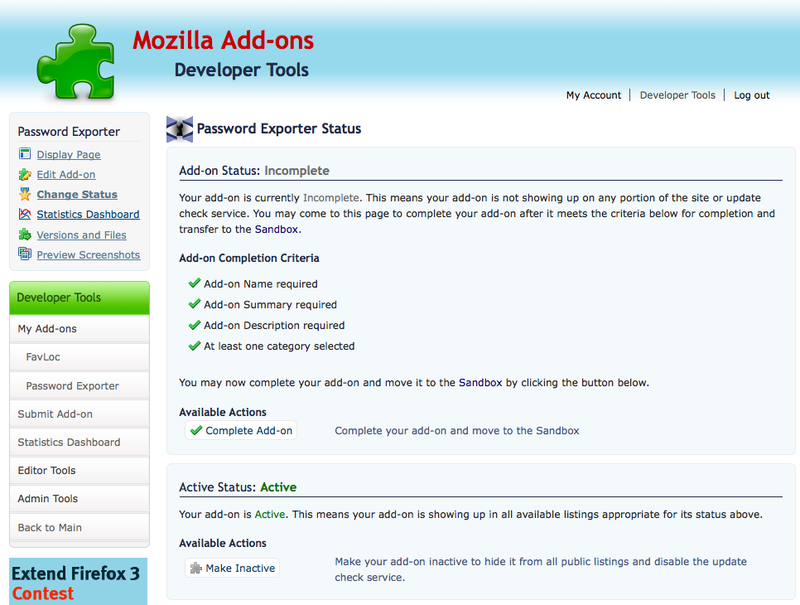 The revamp of the Developer Tools area of AMO has a brand new tool called the Status Changer. This tool provides an interface to see what the status of your add-on currently is, what that status means, and how to get to a higher status if applicable. The interface has two main areas: one shows the status level of the add-on: whether it’s Incomplete, In Sandbox, Public, etc. The other area shows whether the add-on is currently marked as active or inactive. The content of the page varies depending on what status an add-on is currently in, but I’ll highlight a few common states below. 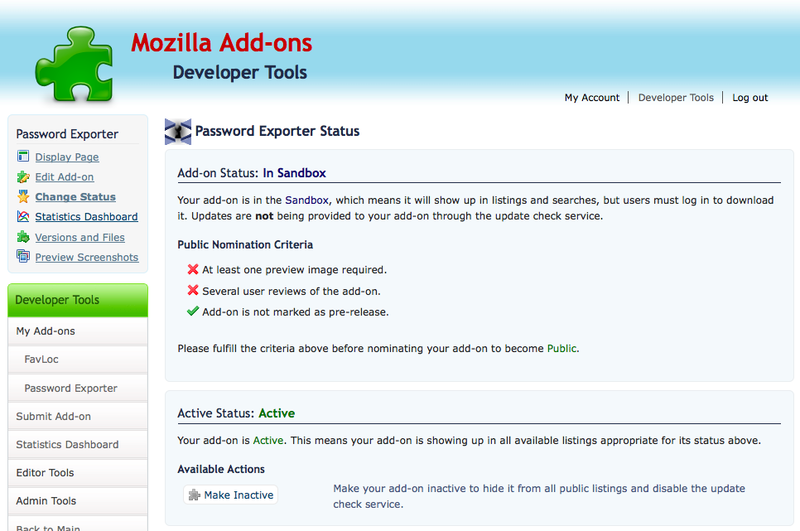 There are 4 requirements to complete an add-on, which are shown on the status page, along with the progress of each. The requirements are filling in the add-on name, summary, description, and seleting at least one category for the add-on. These requirements are not new, just presented in a different way because of the upload process changes. 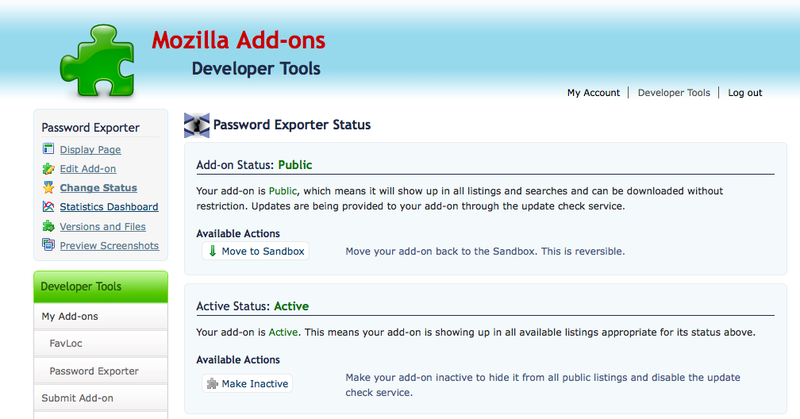 Once all 4 are complete, a button will appear allowing you to complete your add-on and move it to the sandbox. Once the add-on is in the sandbox, the status page will change to show the 3 requirements to nominate an add-on to become Public. These requirements are having at least one preview image, having some user reviews of the add-on, and making sure the add-on is not marked as pre-release. Preview images have always been required for themes, but requiring it for extensions is new. Reviews have also always been required to become public, but because outside reviews are also accepted, not having this requirement complete will not prevent nomination. The nomination button will become available once all requirements are complete, with the exception of user reviews. 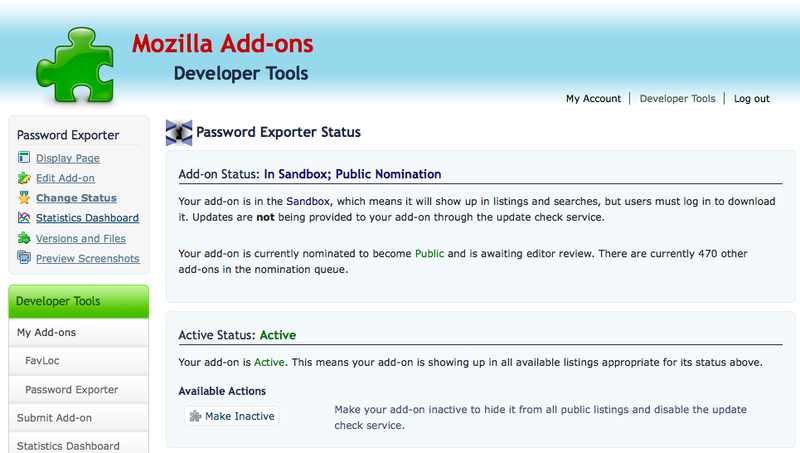 Once nominated, the status page will show the number of other nominated add-ons awaiting editor review. After an editor makes an add-on public, the status page is home to a new feature for authors of public add-ons: the ability to toggle your add-on between public and the sandbox. This update introduces a new add-on field that keeps track of an add-on’s highest obtained status, so that if an add-on author moves the add-on back to the sandbox, it will be able to be moved back public at any time without editor assistance. This may be useful if, for example, you know your add-on has a big bug that will take some time to fix. The main purpose of the status page, regardless of the add-on’s status, is to better document what your add-on’s status means as far as available site features, and how to achieve a higher status. In the next post I’ll talk about the new uploader, which will better explain why the “Incomplete” status works the way it does now.